Dr Brown's Natural Flow 2-Pack 8oz / 240ml Blue Bottle BPA Free . 2 x 240ml / 8 fl.oz WIDE-NECK baby bottles . Helps colicky babies settle down or sleep . Easy to clean, dishwasher safe . ; Dr Brown's Natural Flow 2-Pack 8oz / 240ml Blue Bottle BPA Free . Easy to clean, dishwasher safe . ; Dr Brown's Natural Flow 2-Pack 8oz / 240ml Blue Bottle BPA Free . 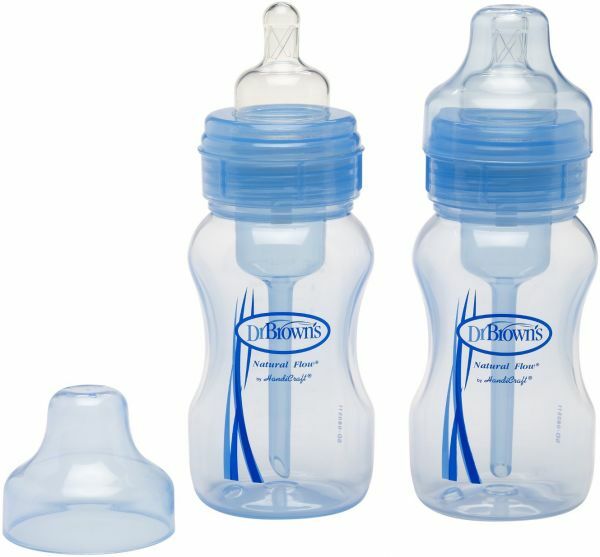 ; 2 x 240ml / 8 fl.oz WIDE-NECK baby bottles . ; Level-One silicone teats . ; Helps colicky babies settle down or sleep . ; Easy to clean, dishwasher safe .